I was out of shape my entire life. But it wasn’t until I got a scary report from my doctor that it hit me like a ton of bricks. In July of 2012, my doctor reported to me that my cholesterol was 267 and blood pressure was 160/98. I was 41 years old. He literally took out his pen and prescription pad to start me on medicine for my cholesterol and blood pressure. I stopped him, promising I would work very hard to lower it myself through diet and exercise. Well, in my true fashion I procrastinated for another 5 months. Then I was asked by my wife, Stacy, if I wanted to run in a half marathon in May of 2013. It was right around Christmas. I decided that this would be my chance to make a New Year’s resolution for the first time in my life. And so on January 5, 2013, I strapped on a Garmin running watch and began to run…. By May 2013, I had lost 20 pounds and ran in the 2013 New Jersey half marathon in Long Branch, NJ. Four days later I walked into Inspire Fitness and met Brian and Cathie. I needed something different to do to keep myself motivated in my new lifestyle. I began attending boot camps, but it was at the first nutritional meeting I attended that I learned about goal setting. Brian emphasized the importance of writing down daily goals, and proclaimed that an unwritten goal is an unfulfilled wish. I came home from the meeting and wrote down 14 goals for myself to accomplish in 1 year. There were things as seeming simple as being able to fit under my kitchen sink to make some overdue repairs, to improving my cholesterol and blood pressure to avoid medications for the rest of my life. By October 2103, I had checked off the last of my 14 goals, which was to get my weight into the 170’s. Well, to be truthful, I still haven’t completed the sink repair, but at least I know I can fit under there when the time comes! 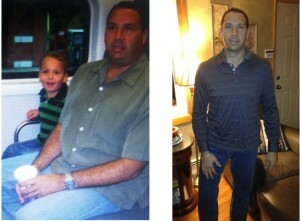 Since I joined the Inspirational family, I have lost an additional 31 pounds, bringing my total up to 51. I have run two half marathons, three 5K’s and participated in the Lake Mohawk “Pass it Along” Triathlon in July. My cholesterol is now 177 and my blood pressure is 122/74. I have read The Compound Effect by Darren Hardy, which is the first book I really ever read. I watch motivational videos, and I’ve seen my coworkers pay attention to my eating habits. I’ve been told over and over that I’m inspiring them to become healthy as well. If that is the case, I can only say that all I did was what I was told to do. Thanks to Brian and Cathie, I exercise 5 times a week and eat a 90-95% non-processed diet of clean, balanced foods. Most importantly, though, I have a new family…Stacy, Anthony and Joseph Walsh. I have become an ACTIVE part of my wife and children’s lives. Since my transformation, my older son has run in two 5K’s, my younger son plays soccer with me (and I can outrun him now! ), and I am training with my wife to run the full 2014 NJ Marathon!! I have a new connection with my loved ones that I never realized I was missing before.